Recipe for crisp homemade garibaldi biscuits with a difference. These ones are heavily studded with hazelnut chocolate rather than currants. Why not. Read on to find out how to make them and also what Garibaldi was up to in Cornwall. I’m not quite sure why, but when I found out the “special ingredient” for this month’s We Should Cocoa challenge hosted by The KitchenMaid, was fame, Garibaldi was the very first name that sprang to mind. Giuseppe Garibaldi played a prominent role in the Unification of Italy in 1870, but as far as I remember from my school history lessons, he was THE figure, not just one of them. I suspect he particularly stuck in my mind because of the famous biscuits named after him. His story seemed rather a romantic one to my somewhat naive mind; with his famous volunteer army dressed in Red Shirts for want of real uniforms, storming across Italy in a bid for independence and deposing despots as they went. He was much admired by Victor Hugo, Georges Sand and Alexandre Dumas, all heroes of mine at the time. He did indeed achieve a lot in his lifetime and led an interesting life – you can read more about him here. I recently found out we have a local connection to him in my part of Cornwall. How very exciting. Trenython Manor, which is not too far from us, was built in 1872 and the architect was commissioned by Garibaldi. It was a thank you to Colonel Peard, who had supported his Italian Campaign a few years earlier along with the Duke of Cornwall’s volunteers. 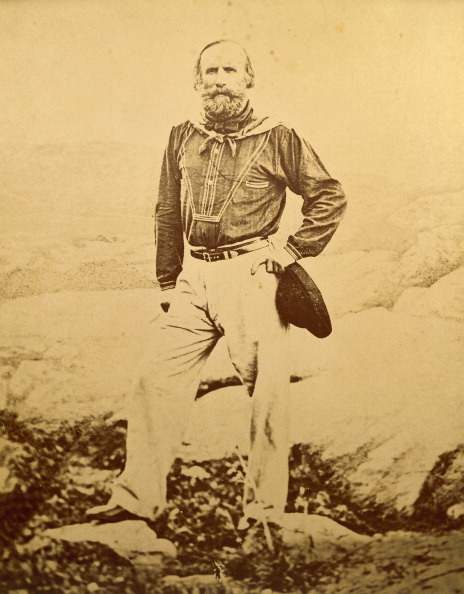 Indeed, Garibaldi visited the Colonel in Cornwall in 1864 and was greeted by crowds of cheering well-wishers. For those unaware of Garibaldi biscuits, they are rectangular, flat, pastry like bakes, heavily studded with currants. They’re a British classic, but are so named in recognition of the limited rations the Red Shirts carried with them. We used to call them squashed flies when I was young. They were a firm favourite, principally because it was one of the few shop bought biscuits my mother would allow; it must have had something to do with all those currants. I’ve no idea if they’re still made, I haven’t had one in years. In fact I might just have to go down to the shops right now and find out. My version of garibaldi biscuits is based on the recipe from British Baking by Peyton and Byrne. Instead of currants, I of course used chocolate. But not just any old chocolate: fairtrade hazelnut chocolate. Fairtrade chocolate is something generally use as a matter of course, but I thought I’d mention it as it is Fairtrade Fortnight at the moment. I’m sure Garibaldi would’ve approved. I used a mix of half wholemeal flour and half white. Many shop bought biscuits often have malty notes to them, so I threw in a tbsp of mesquite powder, which I thought would emulate the flavour. I was pleased to discover that my biscuits tasted like my memories of the real Garibaldis, even though mine were heavily studded with hazelnut chocolate rather than currants. In fact, they were quite delicious and I will most definitely be making them again. They were perhaps a little thicker than the originals, but were crisp with the right texture and eminently suitable for dunking. They were sweet enough, but not overly so with the hazelnut chocolate making a good substitute for the currants. Where better to store them than in a fun new tin I was sent recently. If you keep your eye on things, you might see it featuring in a giveaway here shortly. NB – I did go to the shops and I did find Garibaldi biscuits and I had to buy a packet too. I was annoyed to find that palm oil was used rather than butter, but other than that the ingredients weren’t too bad with currants at 39% being the top one. They weren’t too sweet either and although mine tastes far superior (though I say it myself), they are still not a bad little biscuit. 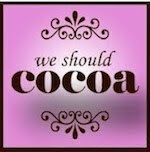 This recipe for chocolate garibaldi biscuits is my fame entry to this month’s We Should Cocoa, hosted by Lucy of The KitchenMaid. Good old Garibaldi! Thanks for visiting Tin and Thyme. 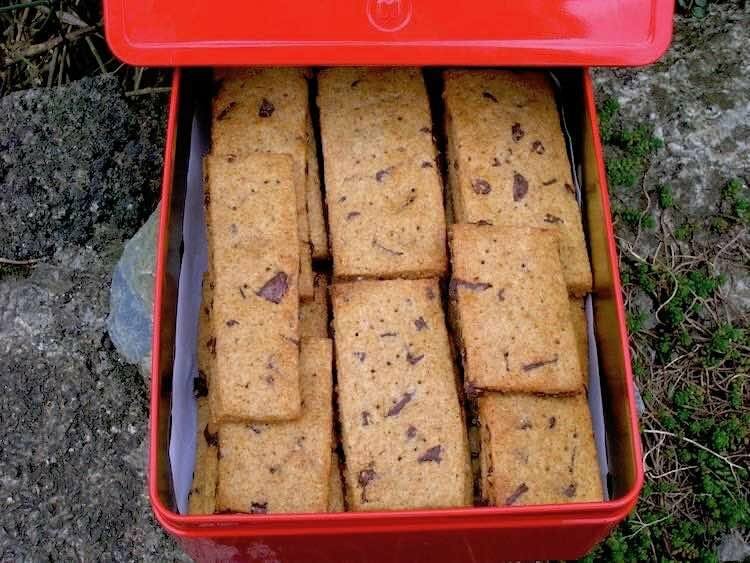 If you make these garibaldi biscuits, I’d love to hear about it in the comments below or via social media. Do share photos on your preferred social media site and use the hashtag #tinandthyme, so I can spot them. For more delicious and nutritious recipes, follow me on Twitter, Facebook, Instagram or Pinterest. Homemade Garibaldi Biscuits. PIN IT. 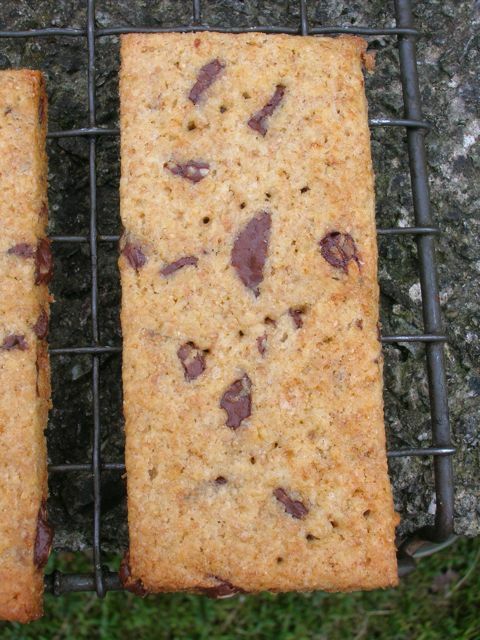 A chocolate riff on a British classic, garibaldi biscuits. If you can make pastry, you can make these. Place the dry ingredients into food processor. Add the butter and sugar and whiz until the mixture resembles breadcrumbs. Add the milk a little at a time until the mixture starts to clump - you may not need all of the milk. Bring the dough into a ball with your hands and shape into a cube. Flour your worktop and roll the dough out to about 5mm in thickness. Trim the edges to make a square, then cut in half to form two rectangles. Sprinkle most of the chocolate over one half (leave a little for the trimmings). Top with the other half and squish the edges together to seal. Roll out to about 3mm in thickness, then cut into biscuit sized rectangles. Prick each one a few times with a fork and place on a lined baking tray. Brush with egg white and place on lined baking trays. Bake for 15 minutes at 180℃ until golden. Leave to cool for a couple of minutes then place the biscuits on a rack to cool completely. Will make between 20 to 30 biscuits, depending on size. Substitute currents for chocolate if you prefer. Maca powder would work instead of the mesquite, but neither are actually necessary. It’s a genius theme and these are gorgeous biscuits. Great little history lesson too. Everything you could possibly want from a blog post! Thanks Dom, it’s good to have the opportunity of doing something a little different sometimes – well done Lucy. I’d forgotten about them as well Katie, which is why it was so strange they were the first thing that popped into my head when I heard the theme of this month’s challenge. I was very pleased to be reminded – they are rather good biscuits. Such a coincidence that I was just reading about Garibaldi biscuits!! I have the same book and I’ve been looking through my books for inspiration for an afternoon I’m hosting next week. Great entry for WSC this month – I haven’t decided yet what I’m making! PS love the biscuit tin! Sounds fun Ros – are you going to make Garibaldis? I have always had a fondness for ‘squashed fly biscuits’ as we used to call them…and adding chocolate is never going to make anything worse! I do quite a lot of the shopping for the tea and biscuits we have at work and avoiding biscuits with alm oil in is very difficult, and it annoys me too. I loved Garibaldi biscuits as a child but your chocolate and hazelnut version seems the way to go, lovely post. Thank you. It seems that quite a few of us enjoyed these as children, must have been the thought of those squashed flies. Not many commercial biscuits seem to use butter, as you say, it’s very annoying. Immediately off to find out about The Leopard. A story about Garibaldi, if that is what it is, sounds just what I’d like to read. Love your odd idea and looking forward to seeing what others come up with. I used to love Garibaldi biscuits! What a nice take on them, and some interesting history alongside too. Thanks C, it seems poor old Garibaldi biscuits have become much neglected, everyone says they used to eat them. Lovely recipe – that use of hazelnut chocolate is excellent. I loved Garibaldi biscuits as a kid but I hadn’t eaten one for decades until I had one as part of a dessert in a fairly upmarket restaurant in Liverpool a few years ago. I was told at the time that Garibaldi visited England (that bit’s true) and that the biscuit was invented after he accidentally sat on an Eccles cake. I have serious doubts about the last bit of that story. Thank you Phil, I was rather pleased with the result. That story is hilarious, that such a biscuit was served in an upmarket restaurant and the squashed Eccles cake. I think you are right to have serious doubts about the latter, although I did know he visited England, on more than one occasion I think. I think I’m going to have to start a campaign to get people eating Garilbaldi biscuits again – everyone is saying, they used to eat them. I love that biscuit tin! I love garbaldi and I imagine that chocolate ones are even nicer than the normal ones! I’ve not tried making my own before. Thanks Caroline. It’s a fun recipe to make – squashing the filling between the two bits of pastry is quite therapeutic. Mmm… interesting reading about Garibaldi. I remember studying that at school. I have never seen Garibaldi biscuits in Italy though. I find it interesting that they are called like that. Your version with chocolate looks very yummy Choclette. Thank you Alida. I think Garibaldi was a bit of a hero over here and when he visited England someone had the bright thought of naming a biscuit after him. Great blog post! I always feel that Garibaldi gets overlooked outside Italy. I actually never liked the original biscuits but yours look and sound delicious – far superior in every way! Well ya learn something new every day! Thanks for the history lesson. The biscuits look scrummy & are a lovely golden colour. Every ow & then I do but packet of garibaldi as I like to try and buy biscuits for the kids that aren’t overly sweet & these fit the bill. The palm oil isn’t great though which puts me off them. Yours, however look and sound like a far more sensible choice. I like making a batch of something sweet at the beginning of the week that can last me so these will be on the list. Thanks Garibaldi! Used to totally love Garibaldi biscuits or squashed fly biscuits as we used to call them too. These look lovely, now thinking could I make them gluten-free or just make them for the rest of the family and looking on in hunger! Chocolate instead of raisins or currants is always going to be a winner 🙂 I watched my husband eat an entire packet of garibaldis the other day – must make these for him! 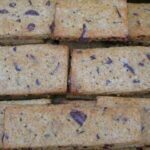 Lovely idea – I do like the texture and flavour of Garibaldi biscuits but these are such a great variation! I’m struggling with the Fame theme though…. will keep thinking! I have an aversion to dried fruit (NEVER eat fruit cake) being in foodstuffs so this variation of the Garibaldi is VERY appealing to me. They look gorgeous! 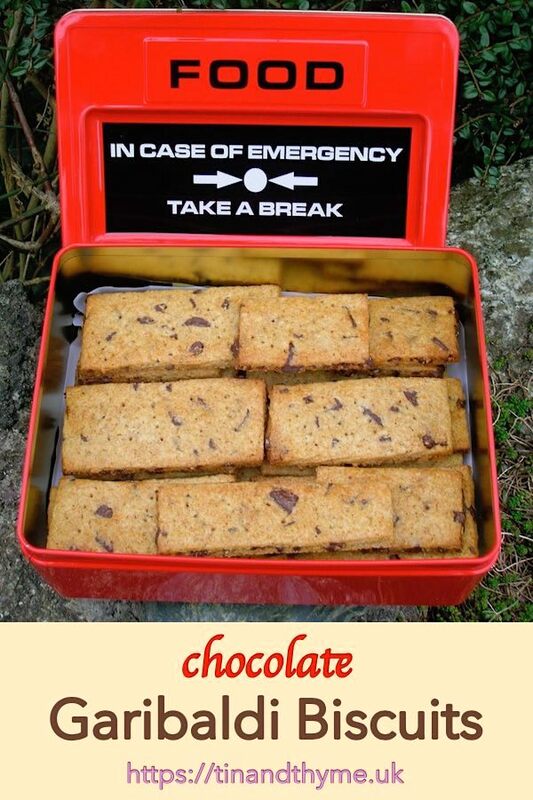 These look delicious and the tin did make me chuckle!